Our project THE BIG TREE PLANT continues, and once again the sap has risen. The title comes from a national project that is funding Big Trees in Cities and, in particular, replacement trees in streets. It was brought to our notice by Broxtowe Borough Council after we had complained about the ‘missing’ highway trees in Beeston, and we agreed to work jointly on finding ‘missing tree sites’. We were supported by the local press and we had a great response in terms of sites suggested and people willing to be ‘Tree-Guardians’. Unfortunately, some of the suggested sites were not suitable, and some privately owned. The result was that in March 2013 seven trees were planted along Devonshire Ave, Beeston, and in the grass verge at the junction of Bramcote Road and Glebe Street, with local residents willing to be ‘Tree-Guardians’, watering the plants when needed and generally keeping their eye on them. 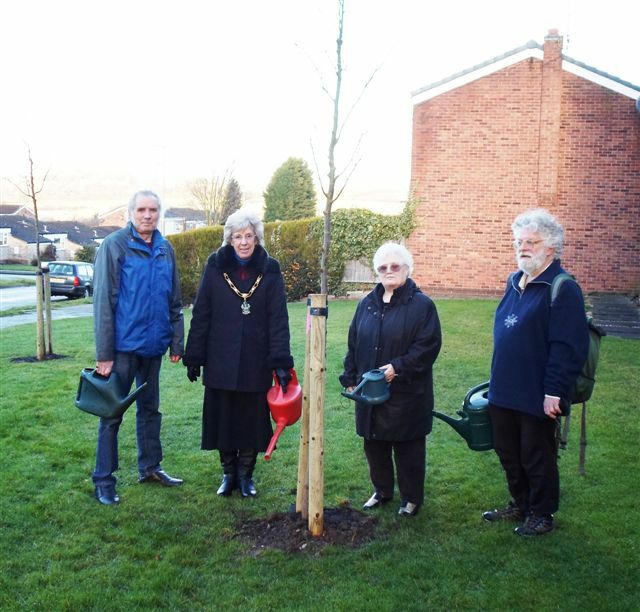 The trees were supplied and planted by Nottinghamshire County Council who are responsible for maintaining street trees in the Borough. In summer 2013, Tim Crawford (Parks and Environment Manager), at Broxtowe Borough Council, suggested that we look at sites suggested in Chilwell by Councillor Joan Briggs and other local residents. We met with members of the Parks team to look at each of the sites. Once again they were checked for nearby vegetation and underground utilities. The result was that Broxtowe Borough Council agreed to go ahead and plant trees on five sites in their ownership. The trees are Oak, Rowan and Cherry, with colour interest in Spring and also Autumn. Aldene Court – 2 Red Oak trees planted in the large round area. Grove Court Central Ave – on the grass verge near the entrance to building – 2 Rowan (Golden Wonder). Welbank Close – grassy area off Field Lane – 5 Rowan, 3 yellow and 2 red. We are very grateful to the local residents, who have volunteered to be ‘Tree-Guardians’, and who will keep their eye on the trees and water them, especially if there is a drought in summer. If you are aware of a site near you, which would be enhanced by one or more trees, then please let us know. We will then meet again with the Parks team to investigate if the ideas are possible. Broxtowe Borough Council is very keen to support the initiative as they work towards their target of planting 100,000 new trees in the Borough by 2016. To date just under 65,000 trees have been planted.